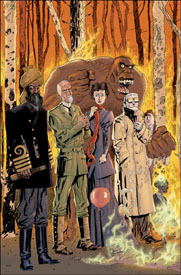 With comic book properties being the hottest thing to hit Hollywood since the resurgence of horror movies to mainstream cinema, The League of Extraordinary Gentlemen seemed like one of the least likely properties to be translated over to the big screen. But with Sean Connery starring and Blade director Stephen Norrington directing, the project, more succinctly known as LoEG, received a greenlight from 20th Century Fox. LoEG is retro sci-fi, which is why it is difficult to see it as being very marketable. The basic set up of the story is that many characters of classic 19th century literature band together to fight crime and solve giant mysteries. The group features such characters as Allan Quartermain (Connery), Captain Nemo (Nassuredein Shah), The Invisible Man (Tony Curran), Dr. Jekyll (Jason Flemyng) and Tom Sawyer (Shane West). The comic book, written by the legendary Alan Moore, blends layers upon layers of literature history with a fun sense of nostalgia. Fans of Moore know that he is more interested in storytelling and not the stories themselves, so it is easy to see why the project will prove very difficult to bring to the big screen. Not only will it be difficult to translate the actual appeal of the books, but it will also be challenging to find an audience that can find nostalgia within these stories and characters. The film will most likely not skew to the younger crowds as there is very little star appeal to the younger generation. And while the concept might be too highbrow for most, the final execution will likely have elements of action in it that will only seem confusing. The studio seems to be worried about the film’s appeal, as they have already added two American characters which originally did not exist in the Victorian England-set comic book story. Unfortunately, the early signs for the film are not that good either. The production faced some terrible difficulties early on as flooding in the Czech Republic destroyed two of their sets and delayed filming. On top of that, rumors of heat between Connery and Norrington have widely spread with neither party denying the rumors. But before we damn this film to hell, we should take a look at the early product first. With an $80 million budget, it is likely that there will be many shiny things to grab a viewer’s attention.